Season chicken drumsticks with 1/2 packet of taco seasoning mix. Sear chicken drumsticks on a medium high heat skillet with just a touch of oil. Once chicken is brown all around, set chicken aside. On a food processor or blender, blend tomato, onion, and garlic. Add this into a large skillet, over medium high heat and let it cook for a minute or two. Keep adding the rest of the ingredients to the pan: rice, chiles, corn, peas, and the remainder taco seasoning mix. Stir well and cook for a minute or two. Adjust salt level to taste. Cover well, and cook on low for 20-25 minutes until rice has absorbed all of the liquid. 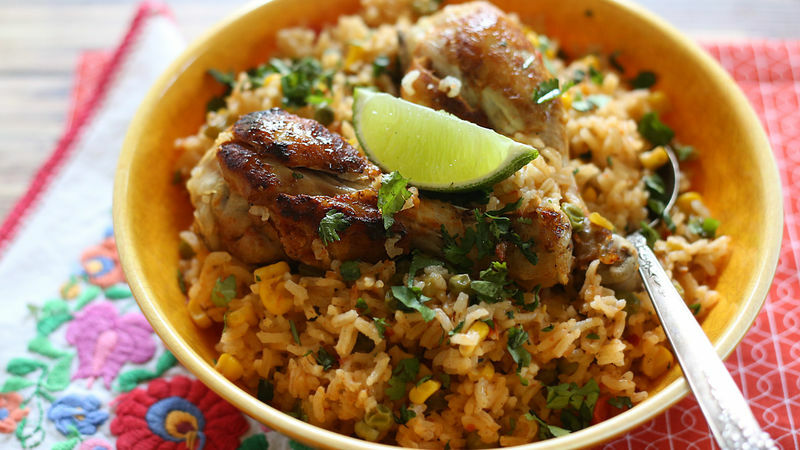 Serve with a generous sprinkle of chopped cilantro and a good squeeze of lime.